Pages helps you interact directly with your audience through Surveys, RSVP Pages, and Landing Pages. What is a Page Set? Pages is WordFly's tool for creating RSVPs, Surveys and Landing Pages. Use Modern Editor to create web pages that are hosted by WordFly. Link to Pages from your email campaigns. Track subscriber responses in WordFly and export results. RSVP Pages collect yes and no responses to opening nights, galas, receptions or any other event! Collect additional information from those attending. Survey Pages are the perfect place to gather customer feedback. Ask customers for feedback about a show and experience, or post a questionnaire before an event. Landing Pages are stand-alone webpages that can be used to promote special events, or other content that needs a web home. Link to RSVP and Survey Pages from Landing Pages (example). Pages are built with Modern Editor and hosted by WordFly. Pages can be linked to from emails or linked to on your website. Tracking RSVP and Survey replies for specific subscribers requires sending an email through WordFly with the Page tracked correctly. Modify design styles from the STYLESHEET > General Styles or All Blocks to carry styles through the whole Page Set. Easily link to any other published Pages when adding URLs to your Page design. Click Browse Pages to view all Pages. The Settings page will give you access to editing your Page design, testing link and publish link. The Results page will display responses after the pages are published. Read the additional FAQs section for more questions about Pages. When you create a new page, multiple files are saved into a media folder for that page. These are called page sets. HTML pages contain the code that the browser renders, and CSS files contain the styles that define the design of the pages. These files can be accessed in the editor via the HTML and CSS tabs at the bottom of the editor. 1. Go to Pages > Media from the main navigation. 2. Click on the Pages media folder and select Open. 3. Click on the Page folder name you are looking for and select Open. In the Page media folder you can access the Page Set files, including: HTML, CSS, and any uploaded media files. Pages must be published in WordFly to be visible to the public. Pages aren't published until a user clicks the Publish button. Pages can be unpublished at anytime and once unpublished a Page is not visible to the public. Users must have Publish permissions to make these changes. From Pages Settings, click on the Publish button to make your page set live. Confirm you would like to make your page set live by clicking Yes from the confirmation dropdown notification. The Public URL is the URL your subscribers will see. Use this URL on a webpage, WordFly Landing Page or linked to it in an email (with subscriber tracking). Any data entered from the public URL will be saved and accessible from the Results page. User has not made any edits to a Page Set. You can't publish a page set that hasn't been edited because the essential files aren't created on the back-end until at least of one the pages in the set has been saved. User doesn't have permission to publish pages. Pages pricing plan has not been selected for account. 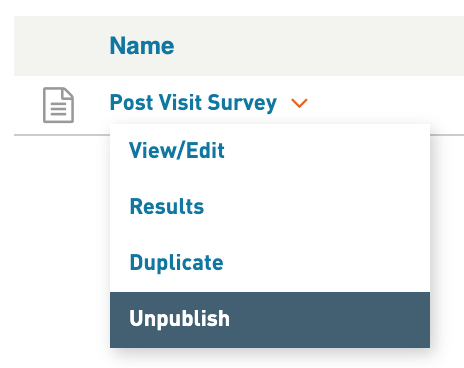 Once a page set is published, any edits (saved changes) will be available on your public page after clicking Sync in the Public URL section. Accessing the public link for an unpublished page will take the user to a landing page that reads: "Sorry, this page is no longer online." To review this page, navigate to the public URL for any unpublished page. Once an RSVP and Survey Page Set is unpublished, any responses collected will still be available in Pages Results. Where can I get more information about Pages pricing? Learn more about Pages pricing in WordFly under Account > Pages Pricing Plan and review our pricing support article. Can I use my custom tracking domain for Pages? No. Your custom tracking domain is tied to email tracking and cannot be used for Pages. Can I setup a custom domain for Pages? Is A/B testing available for Surveys? Use WordFly's A/B template testing option to send two different surveys. First create two different Survey Pages. Then create a new email campaign. From the settings tab of the campaign, check the box I want to do A/B testing for my campaign and then select A/B template. Insert one survey page link into template A and the other survey page link into template B. Can I embed RSVP and Survey forms in my email design? 1. Most email clients don’t support forms. 2. Most ISP filters will block an email with form code in it. This is why you’ve probably never received an email with an embedded form. But, trust us, if email support for forms ever changes we will be well poised to start including them in the body of emails. Can Pages integrated with my Google Analytics account? Not at this time. Google Analytics code involves a script tag which Modern Editor does not support at this time. We'll keep users posted as support changes! Is data collected by Pages encrypted? Page data is not encrypted. Pages should not be used to collect sensitive information (e.g. credit card data).